H'el flashes back to his last days on Krypton, no evidence of the clone war, none of the battles against the sleeper cell faction nor the explosion at Jor-El's lab or his mentor's school. Instead an overly tired H'el is greeted and praised by his own mentor, Jor, and his pregnant wife Lara. It is the night before H'el's exploratory mission and from the far reaches of the planet, nearly the entire populace has arrived ready to watch tomorrow morning's launch. The launch that will save the planet and its people. The Els present H'el with a family crest shield activator for the battle armor (which both Superboy [temporarily] and Supergirl wear now. H'el kneels before the couple, stroking Lara's belly and swears to them Krypton will not die. As we flash back to the present Kara's curiosity is piqued, if this launch did actually happen (in replacement of Superman #0) then why did she never know about it or H'el before he mentioned it. H'el remarks that she must have sustained memory loss of some events during her deep space travels. Indeed Kara did forget many elements of her past when she arrived, so she swallows the explanation, though to seal the deal H'el embraces the young girl, passionately kissing her and then offering to take the journey alone if she no longer wants part of it. Kara reassures him that she is behind his plan wholeheartedly and their moment of tenderness is interrupted by the sounds of approaching forces. Supergirl wavers again, why would they be so determined to stop H'el and Kara leaving the planet in the modified spacecraft? Why would they be opposed to the duo returning to Krypton and bringing it back to life? She is of course oblivious to the fact the ship wont be siphoning solar energy for a trip in space but rather creating an implosion in space to recreate a big bang. In a nearby chamber Lockcoils from Aaricus Prime are fighting Superman and the League. These unique flying worms are able to counterbalance any opposing force and have DNA that can alter itself to any threat. Cyborg is astounded by their physiognomy. The creatures were originally created as guardians for their planet but almost ended up destroying it, before Superman brought them to live inside the Fortress. Wonder Woman is relishing the challenge these almost unbeatable foes represent while a cocky Superboy questions Superman's decision to offer safe haven. Something he perceives as insane or stupid. Superman points out if he hadn't Aaricus Prime would have been destroyed. Superboy makes another snide comment but Wonder Woman warns him off. Cyborg orders the team to stop bickering and tries to recalibrate his boom tube generators to stop H'el from manipulating his tech. Focusing his TTK power, Superboy unleashes a powerful blast that incapacitates all of the Lockcoils. Superman worries about his young clone and warns him not to push himself too far while the armor is still healing him. Cyborg has finished recalibrating and is about to activate a boom tube when Batman stops him. He tells Vic that H'el has been manipulating them all along, the prison teleporter, the armory attacks, the force field, the attack on Supergirl by the Flash... if they are to succeed they need a new plan. Superboy stands up to the Dark Knight and expresses hope that Batman has a better plan than his last one that sent Kon and Kal dimension hopping. Meanwhile Kara and H'el lock upon their now completed star drive. H'el confides in Kara that he doubted this day would ever come, and the euphoria he feels that Earth will make a worthy sacrifice to their cause gives him a new found hope. When Kara hears the word sacrifice alarm bells begin to ring. How is Earth making a sacrifice? The Sun is providing excess solar power, nothing will die, perhaps that is the misconception that Kal and the others have and why they want to stop them. The sound of yet another boom tube brings a smile to H'el's face. He admits that he indeed told Kara that the ship would only draw energy not harm Earth. He also tells Kara that the Justice League no longer pose a threat and that he has been bouncing them around the Fortress while they had been building the star drive. Superman bursts into the chamber revealing that the boom tube sound was a ruse. He physically rams H'el and forces Kara to intercept. She begs him to let them leave, while Kal tries his best to open his cousin's eyes he warns her he is not beyond taking her down if she forces him to. Kon doesn't give her time to respond and slams Kara's face into the floor. 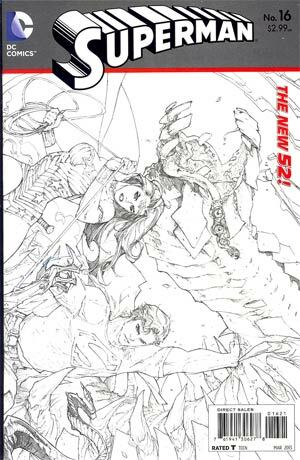 In an instant Superman, Superboy and the League find themselves face down in the snow. Superman is astounded that yet again they have been hurled out of his home, but Batman begs to differ pointing out that they weren't teleported, the Fortress was! H'el picks up the drowsy Girl of Steel and swears Krypton will live. With that he activates the star drive. The effects are felt immediately, from the depths of Dr. Veritas' Block, to Luthor's prison, all the way to the Himalayas where the Herald (from Superman #1) tries again to summon its master, the Oracle. A beam of light shoots from the star drive, out of the Fortress and deep into space. In awe at its beauty the League is also aware it means the end. They have lost. Failed. In space the Starship Authentic reaches a strange statue floating in the far reaches of space. The crew of the Authentic know the legends, if the statue awakens the universe is about to die, as they prepare to turn tail and speed away the statue, the Oracle, blinks to life obliterating their ship and preparing to bear witness to the end of the universe. To Be Continued... in Superboy #17 and Supergirl #17. Story - 4: A far more enjoyable chapter than expected. The unanswered plot points begin to come to a belated fruition, the editorial is back on track with cohesive storytelling going a little way towards the glaring errors in the past three chapters. Lots of these can now be overlooked as the story is nearing the end - though a reader's head might be spinning to follow some if the misinformation prior to the assault on the Fortress. The Superman/Superboy dynamic is again touched upon, with a clever (and unexpected) moment between Superboy and Batman that showed how similar they are. I also liked Wonder Woman stepping up to defend Superman's honor. I dislike the portrayal of Cyborg in the storyline, he is far from stupid yet he is either blindly teleporting the team all over the place all the while knowing H'el is misdirecting him or is gasping all the time - wow Superman your tech is amazing, amazing pets, amazing hangar bay, amazing pretty lights, etc, etc. When he is handled better in Justice League it's almost painful to have him be such a moron here. Supergirl finally begins to suspect foul play, too late to stop H'el or Oracle but at least she's not blinded by lust anymore. Superboy now retooled to be a petulant teenager is far more enjoyable to read, his combative, sarcastic attitude evokes memories of a cocky Conner Kent back in his sunnies and leather jacket days. I must admit that the "H'el on Earth" story has for me been uneven at best. Supergirl's chapters handled far better than Superman's or Superboy's but as it nears the finale and incorporates the elements of Superman #1-6 the story is becoming far more enjoyable. Are the visions conjured up by H'el real, another lie or worse does he actually believe them to be real? I initially wrote off H'el to be as lame as his name but he's proving to be one of the DCU's deadliest evil/misguided forces. I am surprised to say this but I hope his character sticks around to inject some chaos. I also look forward to seeing what was planned for the Herald and Oracle and whether their original storyline was part of H'el's. Art - 4: The art is very enjoyable here, the stylistics in the pencils evoke an epic scale to the Fortress. Superman looks very masculine and Superboy seems back to around the right age compared to the chapter with Luthor when anatomy ran a little riot. The mix in art between titles has been jarring, character designs and costumes all awry. I'm glad consistency has been kept here. The art is definitely this title's strength. 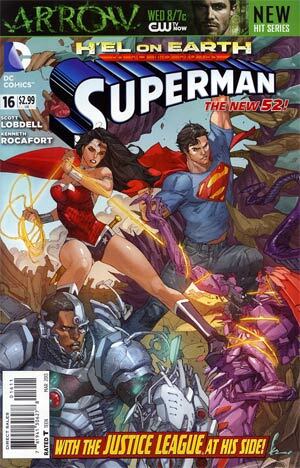 Cover Art - 3: This cover shows the power of Superman and Wonder Woman against the Lockcoils, a great depiction. Whatever your thoughts on them being lovers, they make a truly powerful force that does command attention. As cool as it is to see them duke it out I think the scene where Superman smashes into H'el would have been a stronger one to have.